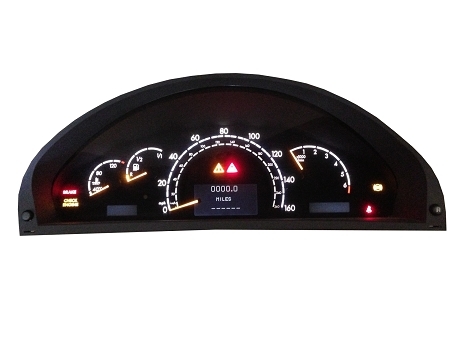 1999-2006 Mercedes Benz S430 S500 CL500 CL600 Refurbished / Virgin Instrument Cluster. Core is typically used as a replacement for completely failed or non repairable instrument cluster. All commonly failing components have been addressed. Replaced components include new OEM Bosch back-lighting transformer and related MOSFET transistors (common issue and reason for failing or failed instrument clusters). Fully tested. When ordering please provide your existing part # (stamped on top of the existing instrument cluster or retrieved via diagnostic session). Includes Free Cloning Service - Requires your existing cluster to be shipped in for cloning. New cluster is then returned Plug and Play (No additional coding required).